Ask most young children what they’d like for their birthday, and their responses will typically include the hottest toy, video game or fashion trend. Lea Dalleggio’s wish, however, was a little more complicated. She wanted a Schlotzsky’s. The franchise, popular in the South, became a favorite destination of hers as a child, when she would dine there regularly while visiting her grandmother in Houston, Tex. 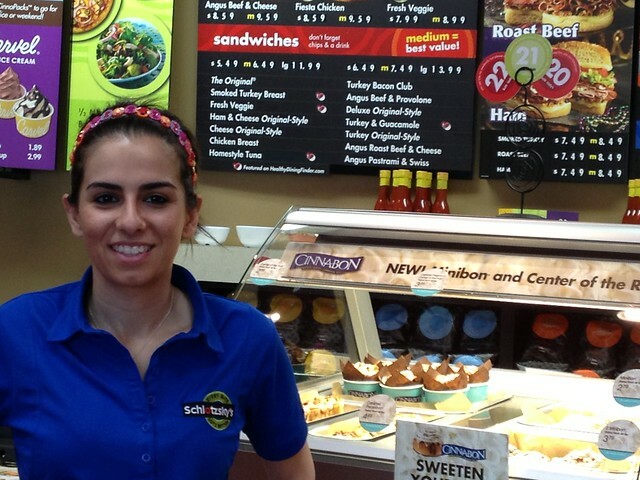 The business venture didn’t make sense for the Dalleggios after Lea graduated college, but her father sold his business while she was pursuing her MBA, and suddenly owning a Schlotzsky’s became a more realistic possibility for the family. Upon completion of her studies, her father bought the New Jersey franchise rights to Schlotzsky’s, and the first eatery recently opened its doors at 39 Nathaniel Pl. in Englewood. The family plans to open 16 additional New Jersey locations over the next five years. The restaurant, which she describes as “brand new and sparkling,” seats 65 people and features a menu that includes pizzas, salads and sandwiches. All bread, Dalleggio said, is baked from scratch on a daily basis. Among the most popular sandwiches are The Original, which contains lean smoked ham, Genoa and cotto salamis, and melted cheddar, mozzarella and parmesan cheese layered with black olives, red onion, lettuce, tomato, mustard and dressing, and the Angus Roast Beef & Cheese, which earned celebrity status in Pain and Gain, a 2013 American crime film starring Mark Wahlberg. Schlotzsky’s also has Cinnabon cinnamon rolls, Carvel ice cream and Jersey Roasters Coffee, and will soon offer yogurt and fruit salad breakfast selections. The soda machine, which contains 129 different flavors, has been an exciting addition to the restaurant, according to Dalleggio. “It’s always fun to see what flavors mix together,” she said. Patrons can take advantage of the Monday “Bunday” deal, which includes any small sandwiches or pizza for $3.99 (after 3 p.m.), or try their luck at Bingo on Wednesday nights. Those who can finish a large sandwich in fewer than 10 minutes — the restaurant’s “Lotza Meat Challenge” — are rewarded with a free Cinnabon and their picture on the wall. Located in the Englewood ShopRite Plaza, Schlotzsky’s is open Monday through Friday, 8 a.m. to 8:30 p.m., Saturday, 9 a.m. to 8 p.m., and Sunday, 10 a.m. to 6 p.m.
For more information, call 201-608-5422 or visit schlotzskys.com. 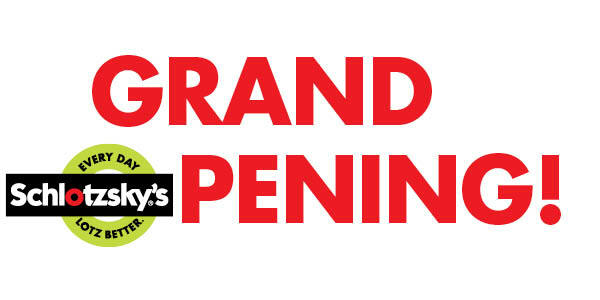 Our first restaurant in New Jersey is scheduled to open on Sunday, March 24 at 10am! Join us for all-day giveaways and a chance to spin the wheel for various prizes. Join the eClub on opening day and you’ll have the chance to win an iPad Mini. Schlotzsky’s will also reward the first 100 patrons who purchase a CinnaPack™ of six Cinnabon® Classic rolls with free Schlotzsky’s or Cinnabon for a year. The fun doesn’t stop on opening day! During the opening week, the New Jersey Schlotzsky’s will support the brand’s national cause, JDRF, by donating 5% of proceeds to the organization. *One small The Original sandwich per week at this location for 52 consecutive weeks commencing on March 24, 2013 and expiring on March 25, 2014. Only valid for persons 18 years or older. Offer valid only at the Englewood, NJ Schlotzsky’s. Schlotzsky’s®, the home of The Original® round toasted sandwich, announced today it has signed 75 franchise agreements for a total of 25 restaurants that will each house the Schlotzsky’s, Cinnabon and Carvel concepts under one roof. “Together, these agreements represent the largest in Schlotzsky’s history,” said Kelly Roddy, President. “We are thrilled to expand the brand throughout Texas and New Jersey with a talented group of business savvy entrepreneurs,” added Roddy, who further noted that the new locations will feature the brand’s ‘Lotz Better’ look, a bright, contemporary feel with a circle theme and a new service model where crew members hand-deliver food to the tables. While Anthony and Lama Dalleggio of Better Bunz, LLC will own the new Schlotzsky’s restaurants, their daughter, Lea, will oversee operations. In addition, the Dalleggios will work with experienced restaurateurs as part of their team to help with site selection, marketing and operations. Family-owned and operated fuel and grocery retailer, Sac-N-Pac, will open non-traditional interstate/convenience connected locations primarily operated along major highways and travel plazas. Each Schlotzsky’s restaurant will share a building with the fuel/convenience retail and have its own entrance, a separate drive-thru and a connected pass-through in the building.